What do you do if you drop your bar of soap on that icky college floor and then you discover ... it has a hair on it? You might just have to throw out the whole bar of soap instead of picking off that hair of unknown origin. 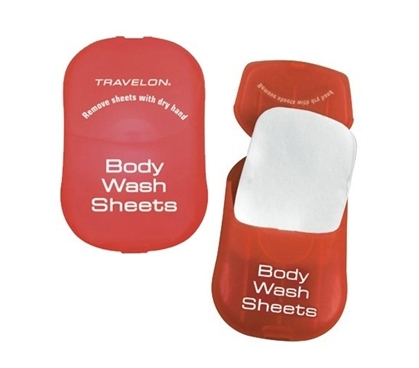 Then, instead of being caught soap-less, try out our Body Wash Sheets - Pack of 50. These sheets are one of the coolest college supplies you'll find! They dissolve easily in water, and 50 sheets should keep you well stocked for many showers. Soap is the most basic item in your college supplies, yet these soap sheets go beyond your everyday dorm bathroom stuff. There's practically nothing to look forward to with communal showering, so you can at least make that daily routine more exciting with some cool shower supplies for college like these Body Wash Sheets. Regular body wash works well, of course, yet it's not nearly as cool as these dissolvable sheets! Plus, bottles of body wash can take up a lot of space in a smaller shower tote for college. These sheets, however, are compact and will leave you feeling just as clean. And if your unprepared-for-college roommate is always bugging you to use your shampoo and body wash, these sheets make sharing your dorm stuff easier! That is ... assuming you don't mind sharing.